People are understandably really excited about the latest hoverboard currently being crowdfunded at Kickstarter. It's called the Hendo and it's being developed by Greg and Jill Henderson for their company Arx Pax. Is it real? Yes. Has our Back to the Future hoverboard finally arrived? Sadly, no. 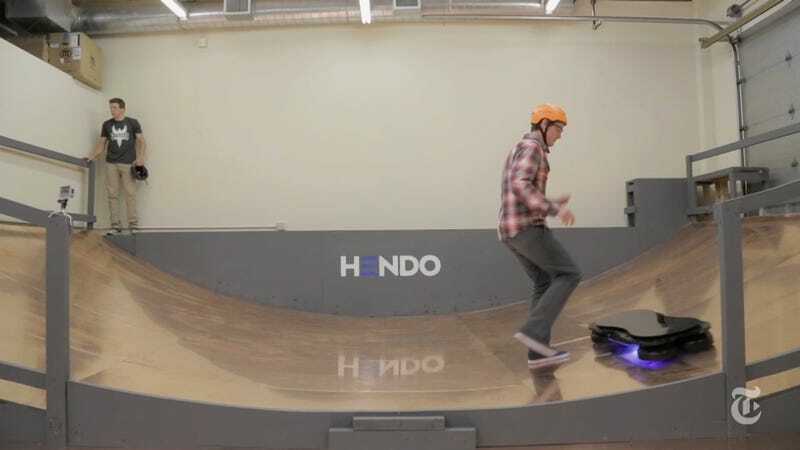 The New York Times reporters who tried out the Hendo explain that the device isn't quite the hoverboard we were promised in 1989 — let alone the one we saw earlier this year. The thing only works on a special metallic surface, the battery lasts "just a few minutes," and it's incredibly noisy. The Verge said it could only be described as a "high-pitched screech" and a "cacophony of squeals." "It's not exactly Marty McFly's hoverboard. Now it only works on special surfaces, and the battery life is only a few minutes long. And it's tough to ride," the New York Times explains in a new video shot at Arx Pax in Los Gatos, California. The biggest problem for those of us pining for a real hoverboard is that the Hendersons and Arx Pax are admittedly just using this particular application of their technology as a publicity stunt. Long term, they're not actually interested in developing a hoverboard. The company has patents for building foundation systems to prevent earthquake damage, which is their real goal. "So no, I did not feel like Marty McFly. But you can definitely tell you're floating. That's for sure. You can kind of feel that something is lifting you," Conor Dougherty from the New York Times explains. "We can't go over water or sidewalks yet. This is the Model T," Greg Henderson told the New York Times in defense of his creation. The trouble is that it's not really the Model T. Henry Ford built the Model T and saw it as the perfection of the automobile after many iterations. The Hendo isn't even the Model A. It's Henry Ford's shopping cart.